SCI's Aluminum Gang Forms for circular wall forming as in this 110' (33.53 m) diameter round tank at a sewage treatment plant. 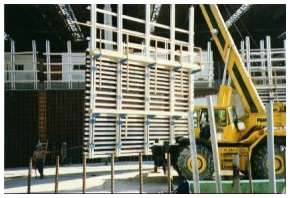 SCI's Aluminum Joists were used vertically and SCI's standard Aluminum Strongbacks (Generation I) were custom rolled to the precise radius for the outside forms and the inside forms. Forms were assembled into Gang Forms and used three times vertically on each tank. 180 degrees of outside forms were furnished +90 degrees of inside forms were furnished. The project consisted of four identical tanks. 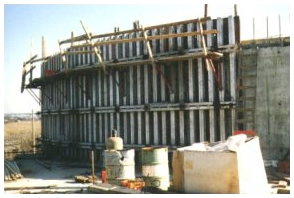 SCI's Aluminum Gang Form System used to form 18" thick concrete walls 100 ft. high (30.5m) at this solid waste recovery facility.